Happy birthday Bernadette Watts (Ugly Duckling). This week we celebrate Children’s Book Week, a great time to look at old classics and new favorites. A couple of years ago for Scholastic Book Clubs, I worked with more than twenty children’s book experts to identify the best books to include in their offerings. When we took our original ballot, before discussion, one book garnered the most votes, one I would not have predicted. The favorite of children’s book experts across the country: Amelia Bedelia! Well, Amelia turned fifty in 2013 and was given a wonderful fiftieth anniversary edition that contained a good deal of archival material. Peggy Parish drew from her experience as a third grade teacher and the ways in which her students mixed up words. 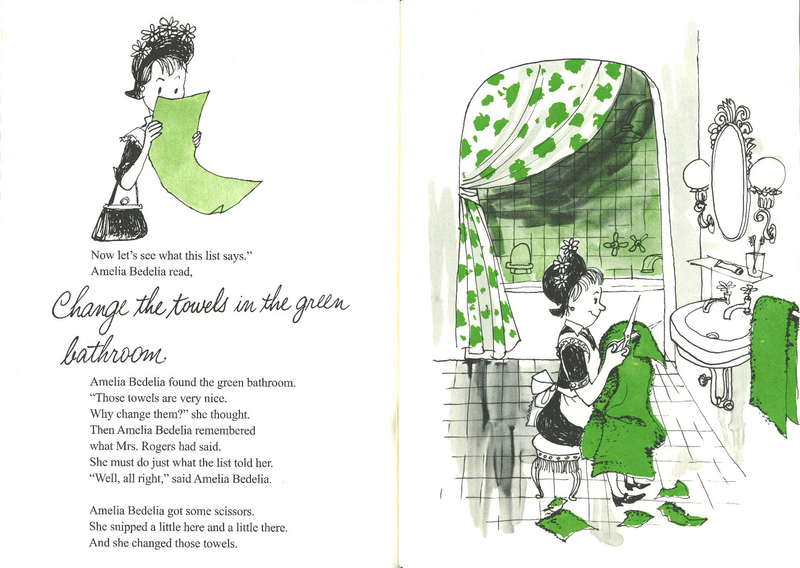 The hilarious housekeeper Amelia Bedelia and her literal interpretation of language were born over lunches with Peggy and her editor, Susan Hirschman. In the first story of this classic saga of a loveable noodle head, Amelia follows a list of tasks on her first day of work as a maid. When told to draw the drapes, she sketches them; she measures two cups of rice with a tape measure; and she “dresses” the chicken—literally. Although she might have been fired at the end of this disastrous day, Amelia has a secret weapon: her lemon meringue pie. It tastes so good that she gets invited back for another day. The humor of the book relies on the interplay between text and art. In the material in the afterword, readers learn that artist Fritz Siebel worked on the advertising campaign that brought Mr. Clean to the world. Siebel created his children’s books in the preseparated art era, hence the muted palate of the original title. For those who prefer a brighter rendition, the paperback I Can Read version has been colorized. Amelia Bedelia appeared on the same 1963 Harper list as Where the Wild Things Are; both have been engaging children for fifty years. Children need to feel when they read books that they are smart. And no one makes them feel smarter than a character that is confused about language. 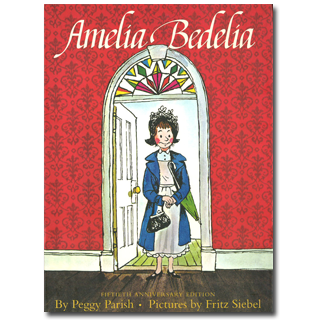 What makes Amelia Bedelia such an attractive protagonist is the strength of her character. When she makes a mistake, she goes on. She remains positive and upbeat, no matter what happens. In the end she actually teaches children a lot about vocabulary, even while they are laughing at her silly mistakes. Happy fiftieth birthday, Amelia Bedelia. Let’s all have some lemon meringue pie in your honor. Originally posted May 13, 2013. Updated for . Amelia Bedelia! She’s always so much fun and definitely stands the test of time. I read her books over and over as a child – funny how they didn’t lose their charm. Years ago, when I was a news producer, I was fortunate enough to have the talented Lynn Sweat (one of the subsequent and frequent illustrators of the series) as a guest on my show. He was so charming and gracious and did on the spot drawings of the news anchors and crew. I loved how excited the newsroom got about his appearance – almost everyone had loved Amelia Bedelia as a child and the affection lived on.